More Than Simple Digital Signage. The Competition is Getting Smarter. R U? 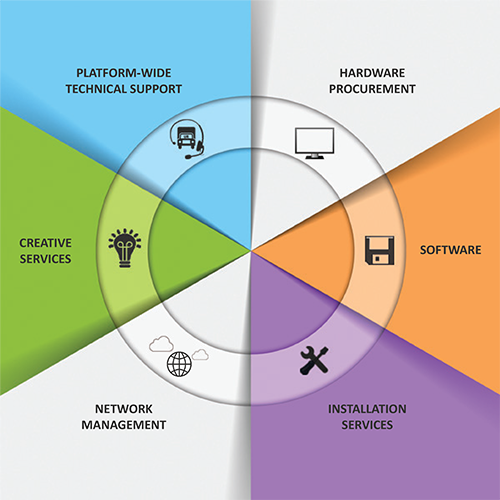 Appealing to leading organizations, we deliver your entire channel, from hardware procurement, software, installation services and network management, to ongoing creative services and platform-wide technical support. Becoming an extension of your team, we work with you to strategize and come up with the best possible solution. We strive to go beyond expectations helping you achieve your business goals. Focusing on you as a partner allows us to understand and complement your business now and into the future. UR-Channel’s capabilities and services produce cost savings, productivity benefits and potential sales uplift for its clients. Our ‘Full Circle Approach’ to applications and services represents simplicity, scale and superior value with the ultimate goal of delivering extraordinary experiences. A dedicated Account Manager will oversee your entire channel, streamlining processes and freeing up valuable resources. UR-Channel's strong partnerships with industry leading suppliers delivers an optimal solution at the forefront of technology. Our open architecture, non-proprietary, Windows based platform offers the best 3rd party compatibility in the marketplace. UR-Channel develops and supports the applications required to successfully run our portfolio of solutions. Systems are modular for flexible user control, from self to fully managed, with varying levels of administration to suit your needs. Whether taking advantage of our SaaS based hosted model or doing it yourself, UR-Channel's architecture allows for easy setup and scalability. Comprehensive distribution enables us to reach dense, challenging environments or remote areas. UR-Channel's in-house Creative & Marketing Department is a true 1 stop shop that manages all areas of the creative process from brainstorm sessions to production. Leveraging your available assets, we transform new or repurposed assets into entertaining, engaging, and informative content, giving your message maximum exposure and impact. UR-Channel's 7-day Trilingual Technical Care Centre residing under our roof is only a phone call or email away. Platform-wide technical support includes proactive monitoring, issue resolution, troubleshooting, and warranty/non-warranty repairs. The ‘Full Circle Approach’ means we’re with you every step of the way, now, and into the future… evolving with your needs, keeping you at the forefront of technology and ensuring that you put out the right message at the right time to your audience.